Hummus is one of those foods that is very easy to make and is super good for you. 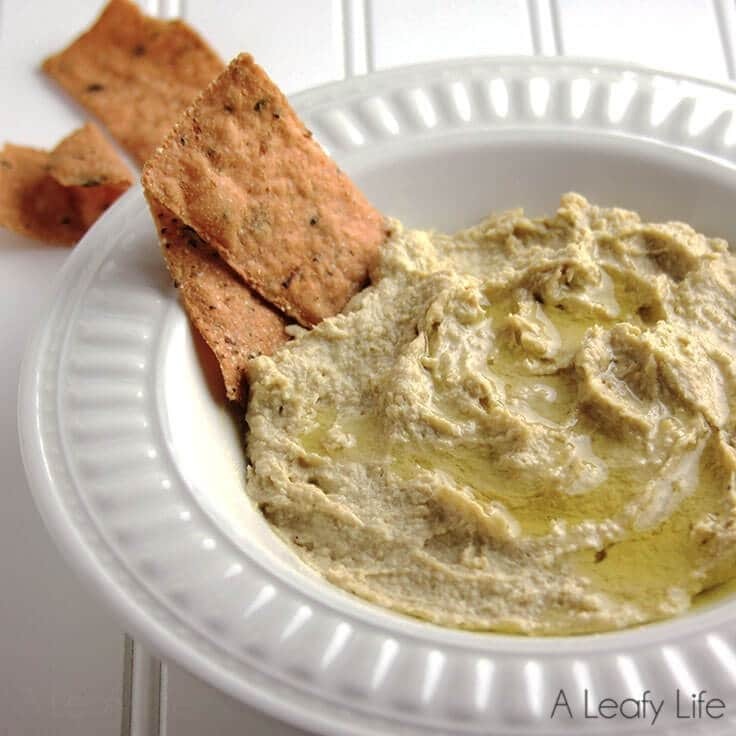 Lemon and garlic hummus is just plain sinfully delicious! Hi, I’m Lisa from A Leafy Life, back this month with a super easy Lemon and Garlic Hummus Recipe. This hummus is so delicious and addicting that once you start eating it, you won’t be able to stop. I know I couldn’t! 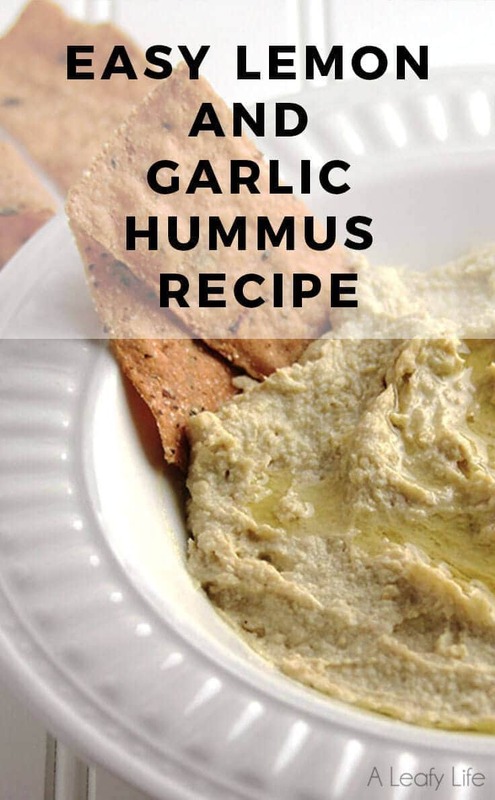 Hummus is one of those things that can be made a million and one different ways because you can make it with different beans, a variety of additives, and a mixture of spices. Sometimes, I prefer the simple, classic hummus. The kind made with chickpeas and tahini. For this recipe, I added plenty of garlic and lemon…yum! The great thing about hummus is it’s simple to make and very good for you because of its healthy ingredients like chickpeas, garlic, olive oil, and lemon. I love to whip up a batch on Sunday and eat it throughout the week. Now, there’s a big decision you need to make when using chickpeas in hummus….to skin or not to skin. If you want super creamy hummus, please, by all means take the skins off. If you are a bit on the lazy side (like me), leave the skins on. Totally up to you. Are you ready? Instead of using regular olive oil, I use lemon olive oil. Yep, if you like lemon, this is really worth purchasing. 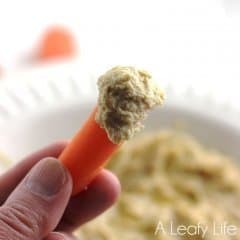 If you don’t want too much lemon, just use regular, but I just love the added lemony taste it brings to this hummus. Use a food processor or blender to blend the chickpeas and about 1/2 of the liquid from the can. Add the tahini, juice of one lemon, minced garlic, cumin, and salt to the chickpeas and blend. Pour olive oil to make it creamy and smooth. Add some of the liquid from he chickpeas if needed. You can refrigerate the hummus for about a week. If you take it out and it is a little dry, feel free to stir in more olive oil. 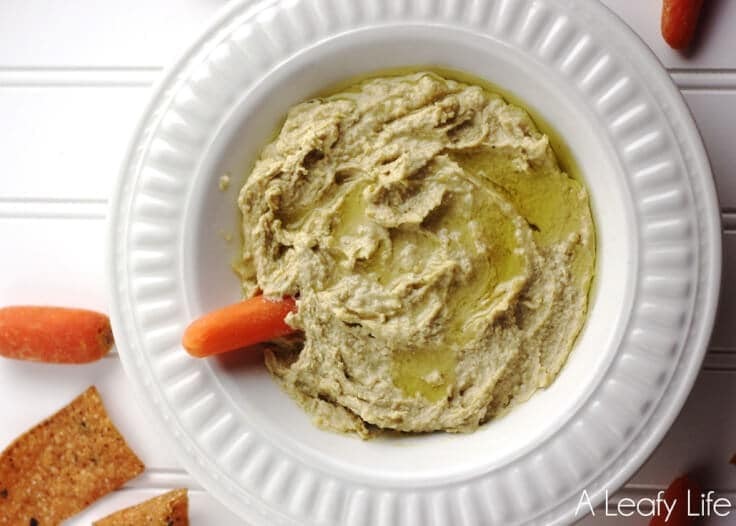 Use it as a delicious dip for chips, vegetables, or pita chips. 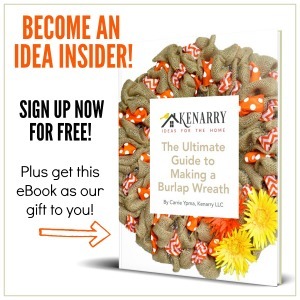 Another great idea is to spread it on a sandwich instead of mustard or mayo. 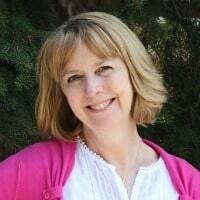 Lisa is a vegetarian living in Wisconsin with her two daughters, husband, and dog, Macey. Her blog, A Leafy Life, is a food blog that focuses on easy, fresh, and simple meat-free recipes. When Lisa isn’t developing delicious recipes, you can find her working as an Executive Assistant or playing piano at her church. She enjoys reading, creating projects with Stamping’ Up! products, and taking long walks. I add chipotle I adobo to my hummus. It is awesome if you like spicy. Oooh! That sounds like a great addition to spice things up. Thanks for sharing, Nancy!